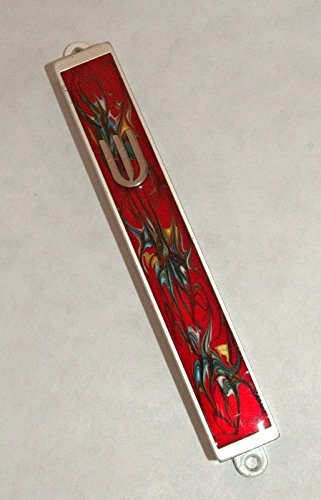 Beautiful Mezuzah case made of metal decorated with a colorful retro style stripe with a silver tone Shin on the upper part. The case comes ready with a double sided stick tape and bolts for quick attachment, and a card with the blessing words in Hebrew, Russian and English. The case does not include a scroll- it will fit a 10 cm/4" scroll. 5.5" long; 0.5" wide weight (without box): 77 gr comes well wrapped in a gift box Unique and beautiful! A silver tone Shin on the upper part. If you have any questions about this product by Collecting Trends, contact us by completing and submitting the form below. If you are looking for a specif part number, please include it with your message.